Discussion in 'Sheaths & Such' started by knoxknives, Aug 4, 2018. I've only made @ 20 knives or so, and finished this nessmuk inspired skinner recently. 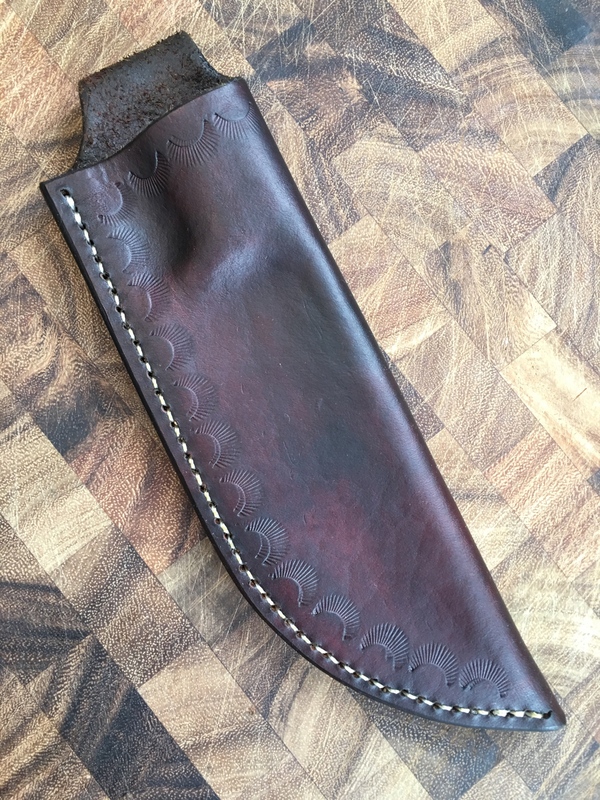 I could not find a sheath anywhere to fit, mostly due to the 2" wide blade, so decided to bite the bullet and make my first sheath. Not perfect by any means, but i'm pretty satisfied with it. hughd, mitch4ging, Cryptyc and 2 others like this. The sheath isn't bad either. I can't see the edge but IF it doesn't have a welt, it really needs one. You are off to an awesome start! Well done!! That sheath will last forever! I like it. Is it fancy? No, but it is a solid, well-made sheath that I think really suits that particular knife design. 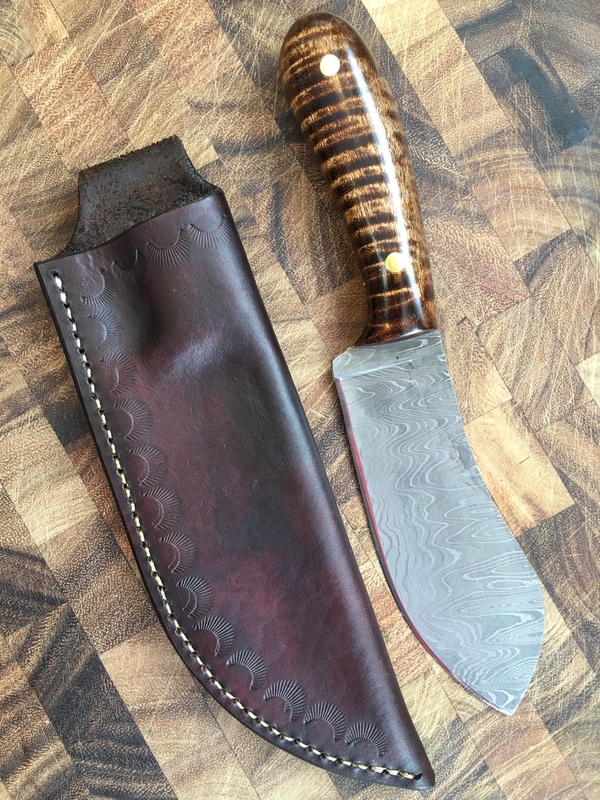 The stitching is very good, you did a good job of molding the sheath to the knife, the dye job turned out really well, you put a welt in, and you finished the edges. 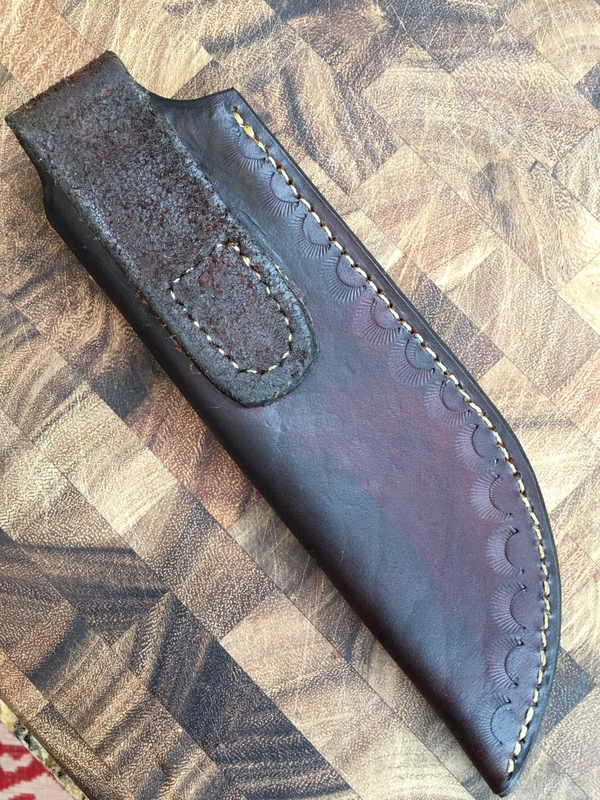 I think you did a great job, especially considering the fact that it is your first sheath. Tablesaw and hughd like this. thanks much popdandy! yes I tried to get most features right that have been shown by several here on this forum, and watched several youtube videos. Few things I didn't do right; I had forgotten to finish the edge on the belt loop before I glued/stitched it, so improvise down at the stitching best I could. I also had never done any stitching before so had to watch a few videos for that, I didn't cut a long enough thread the first time I started, it so after I got 1/3 way done had to remove it and start over with a longer thread. 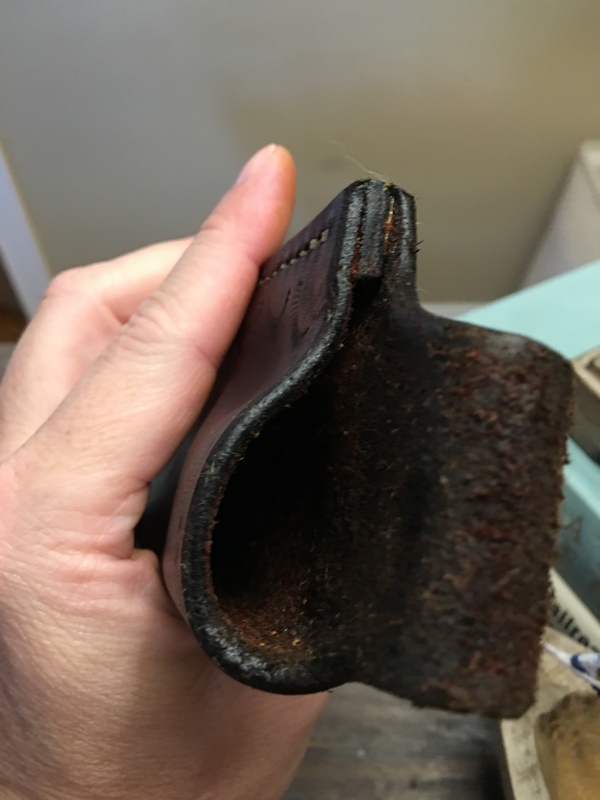 I have a Tandy Leather store here in town, so that made it easy to buy supplies, maybe too easy, this sheath cost me $145. well the next 4-5 will be free, but you know what I mean. edit: also I just remember I cut out a left handed sheath by accident first. 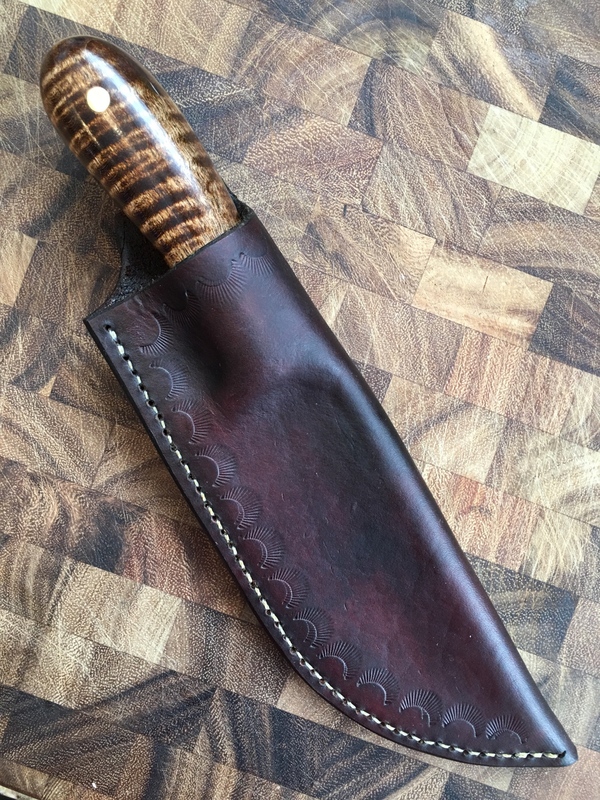 overall admit i'm a bit proud of the sheath and the knife, i'll be keeping this one for myself and pass down to my kids someday. Looking very good man! Dont worry about those mistakes, we all do them from time to time, cutting the occasional lefty sheath is my biggest, but I am left handed so Bonus! That is if I own that particular design.